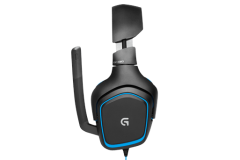 So far, we’ve reviewed 4 items from the current Logitech Gaming “G” series of products, a couple of months ago we started testing out a fifth, the G430 Gaming headset – it’s a ripper but it also showed us that first impressions aren’t always accurate. Some products benefit from being reviewed over a longer period. Typically we use an extended review period to give the build quality and practical elements of a product every chance to shine…. or fail. It also gives us a chance to notice things that may not be immediately obvious. 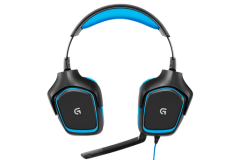 My initial observations were that the G430 was light to wear but the tension made the headset one of the less comfortable ones I have tried out of the box – it just felt tight even when adjusted to fit properly. First impressions can be deceiving though, and after about 2 weeks of daily use the headset went from being ‘tight’ to a really likeable ‘firm’. In line with the current G-Series products from Logitech, the theme is blue/black. The blue is pretty hard to ignore. 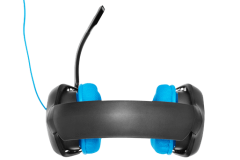 I think Logitech took a bit of a gamble here with the blue cable and ear cups where a more subtle approach might have appealed to a bigger market. The flip side is that these headsets are easy to spot in the crowd and there is no mistaking them at a LAN event. At the recent Respawn LAN in Melbourne I noted the G430 headsets and how they were easily identifiable. 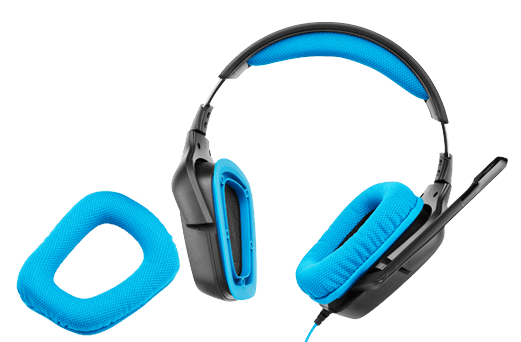 The swivel ear cups are light and plastic in construction, the hinges/swivels are also plastic rather than metal. 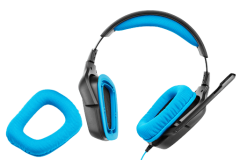 This construction keeps the unit very light to ear but it still feels durable. The boom mic lifts up out of the way and also bends at the end so that you can adjust it to suit your preference. There is an auto mute that kicks in when you stow the boom mic vertically on the left the ear cup and the inline volume/mute control isn’t far away either. The inline control is well spaced and easy to use with one hand so you don’t have to stop gaming when adjusting the volume or muting a sneeze or cough. 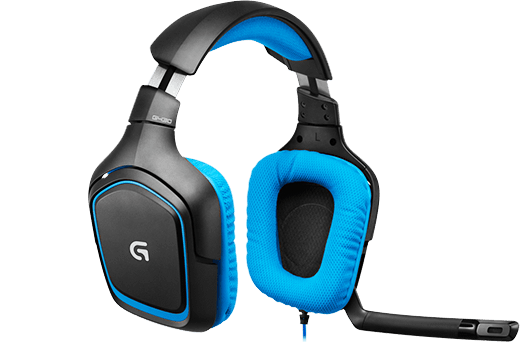 Under the top band of the G430, Logitech has attached a blue fabric covered foam head rest. 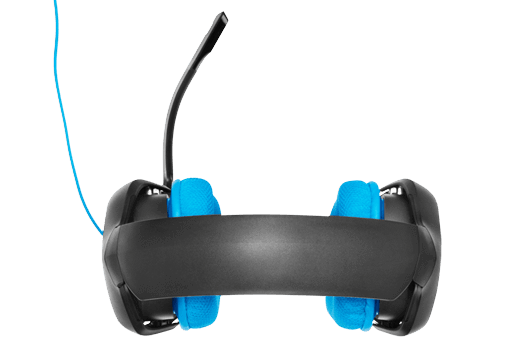 It’s firm but not uncomfortable and keeps the headset in place with a snug fit. I asked a few people to try the headset and a couple tried (unsuccessfully) to shake it off. Everyone that tried it in the first few weeks commented on how light it was and most also noted the snug fit. A head set shouldn’t move around and this one certainly stays in place. Aesthetically, the blue probably won’t appeal to everyone but the branding is pretty lean with just the Logitech “G” on each ear cup and the inline remote. 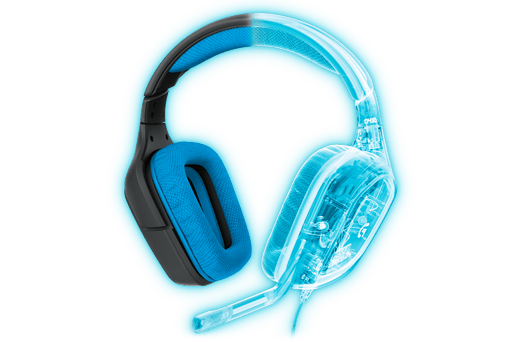 I like that Logitech kept the branding subtle and with their colour scheme, the headset is still easily identifiable. The packaging isn’t anything special but you can see what it is clearly through the clear plastic shell and the contents are well protected. Accessories include the G430 headset, USB Audio adaptor, Manual/documentation – it’s everything you need and nothing extra. Build quality is interesting in that the headset is light but doesn’t feel fragile and there is a metal (looks like aluminium) band inside the head band for support and durability. The G430 doesn’t look or feel as tough as the beastly Thermaltake Level 10M, but it’s important to note that the G430 is lighter and cheaper. The cable braiding is good with a velcro strap attached to keep everything tidy. 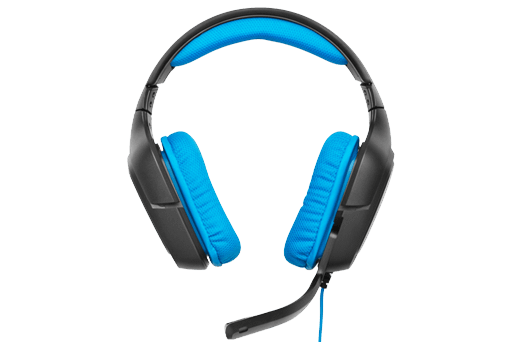 The 3.5mm connections are not gold plated like other more expensive headsets. Washable ear cups is something different and the padding seems durable but only time will tell with the materials – for our purposes, we couldn’t fault the build quality or materials used.